The words "Go Trump" were spraypainted on the park's grounds in Brooklyn Heights. Since Donald Trump's election last week, there has been an uptick in the amount of "biased-based attacks" across the nation. One of the latest victims is the the New York City memorial park in honor of the late Beastie Boys member Adam Yauch. 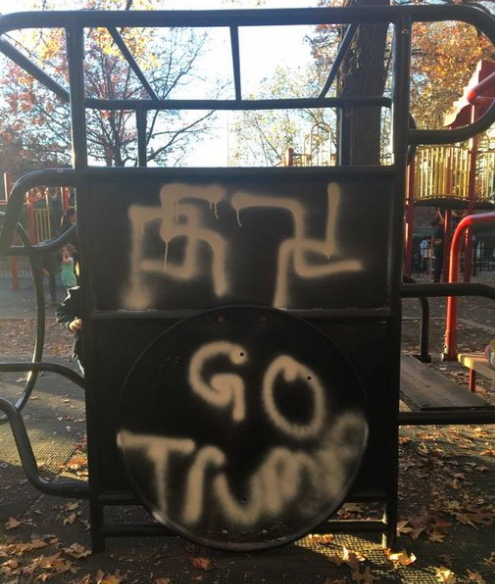 The Adam Yauch Park in Brooklyn Heights was defaced with graffiti of swastikas and the words "Go Trump" on Friday (Nov. 18). Yauch, like the rest of his Beastie Boys bandmates, was Jewish. This anti-Semitic stuff is happening all over the country. The white nationalist "alt-right" is neo-Nazi. But we knew that. Their leader is going to be in the White House on January 20th.